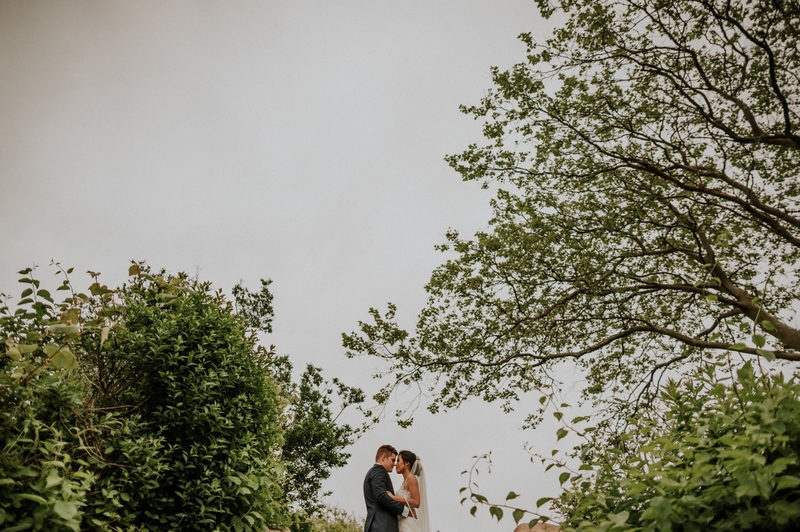 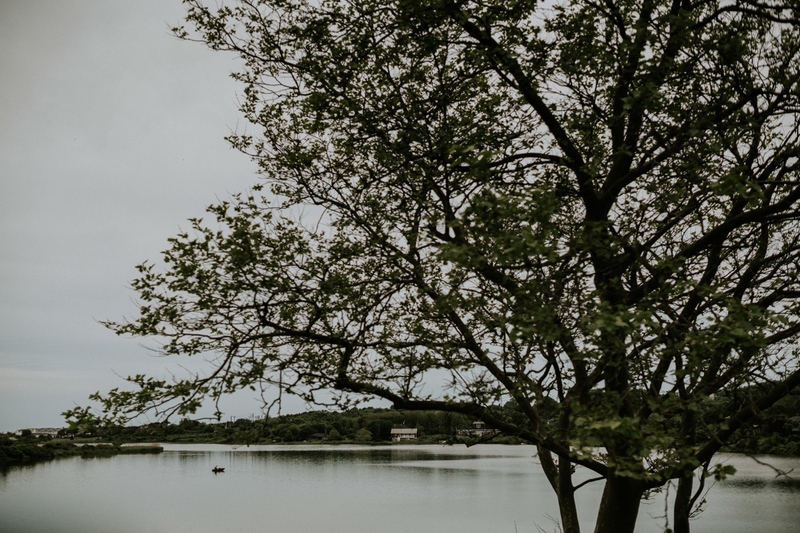 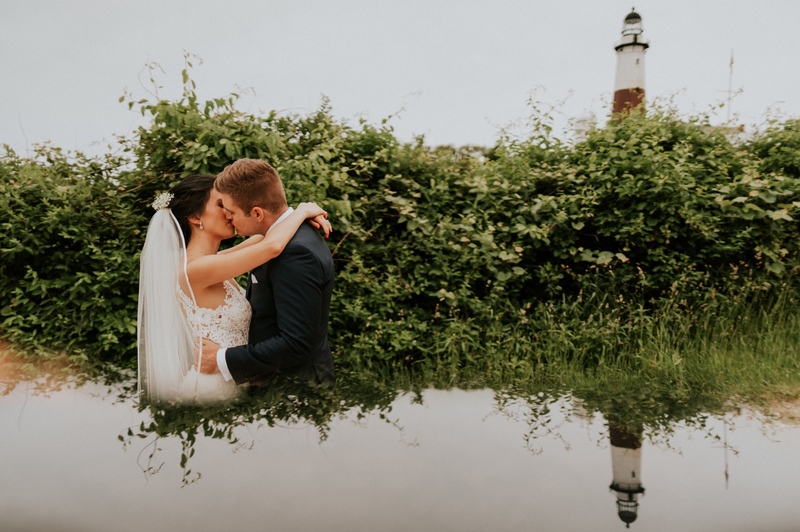 Carisa and Dirk dreamed of a wedding by the water so they invited their friends and family (some of the nicest people we’ve ever met!) 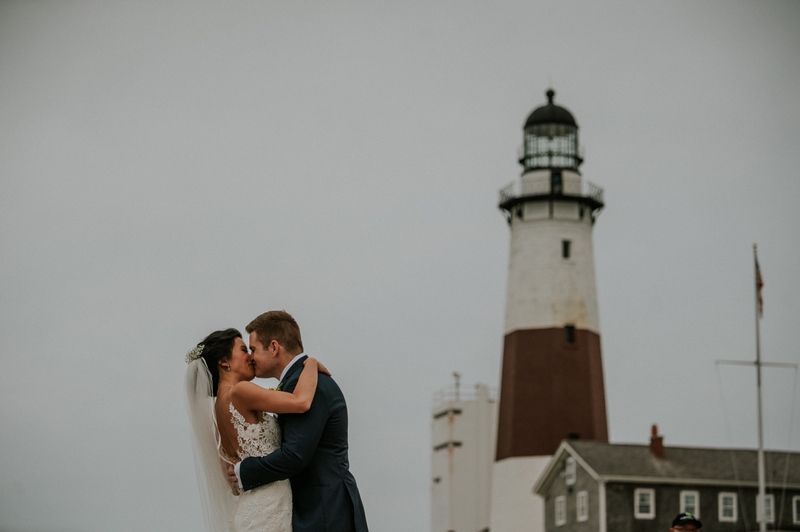 to celebrate by the ocean in Montauk, New York. 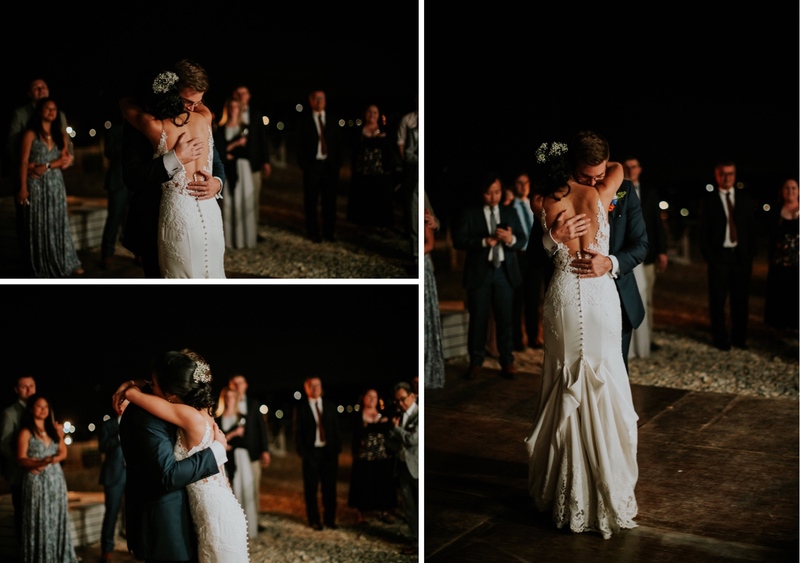 It was incredible, beyond words. 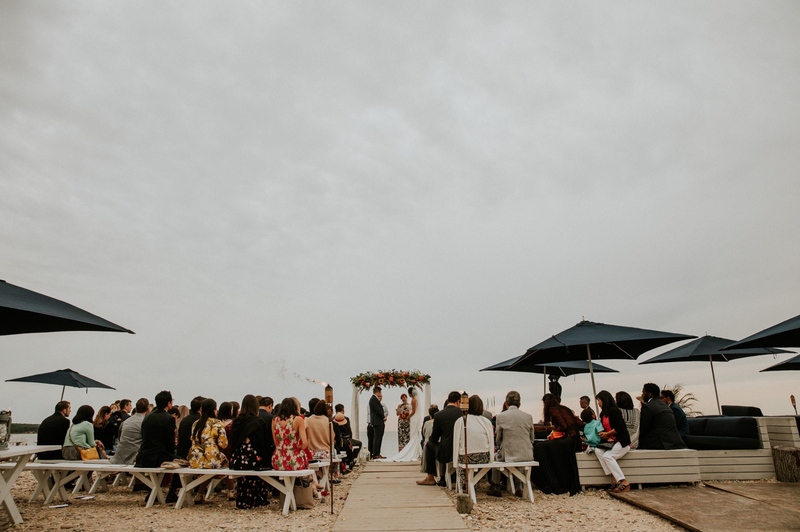 Navy Beach was the perfect venue for their celebration. It’s tucked away just outside of town, and really feels like you stumbled upon an incredibly special, well kept secret that should be known to locals only. 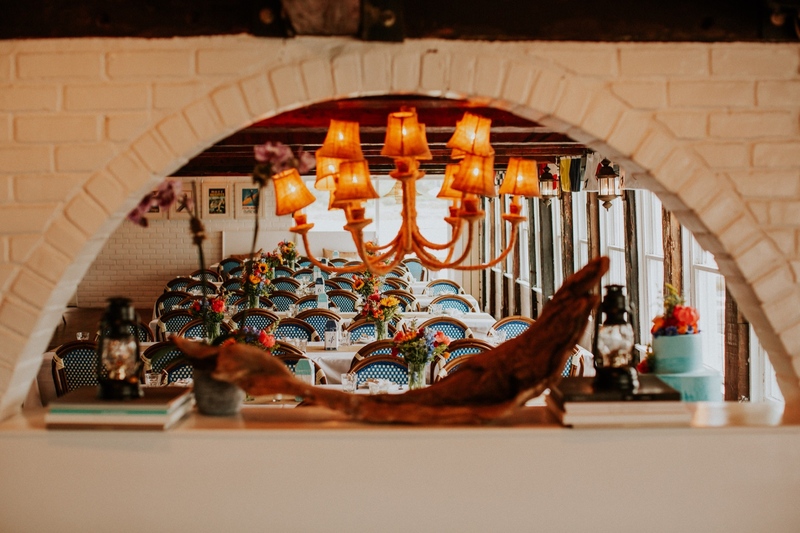 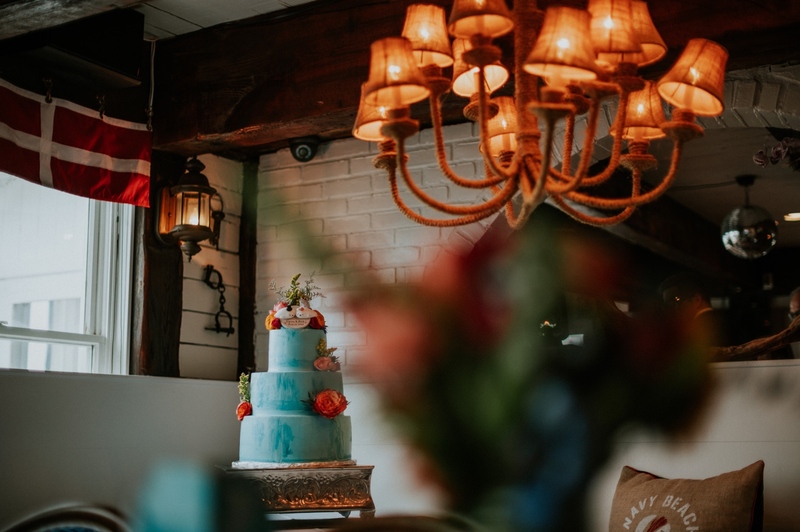 The decor is nautical, but classy with so much good taste. 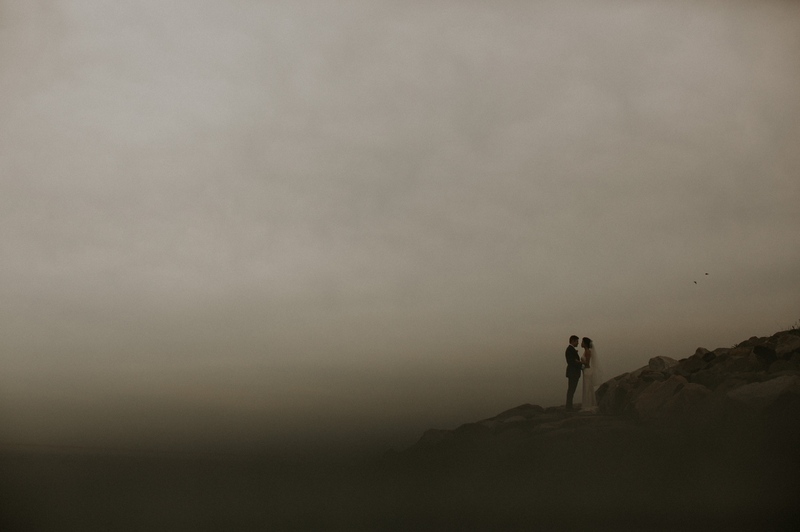 It’s the ideal setting for a good time, and boy, was it ever. 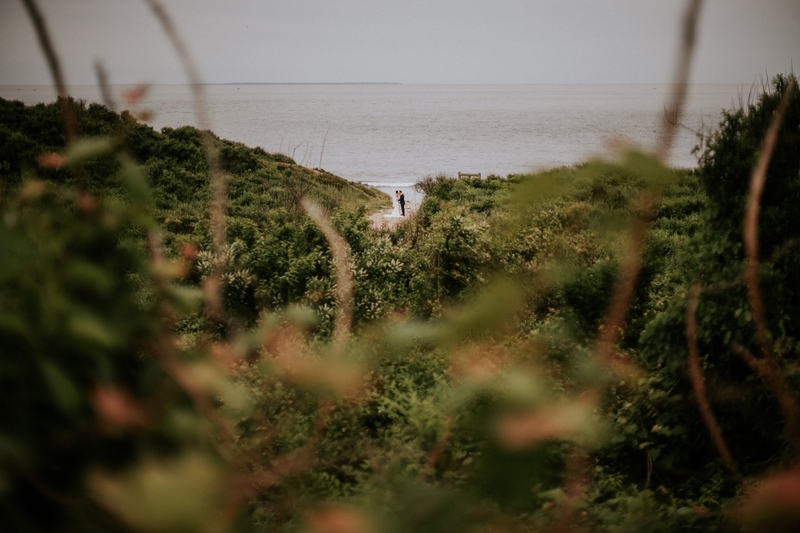 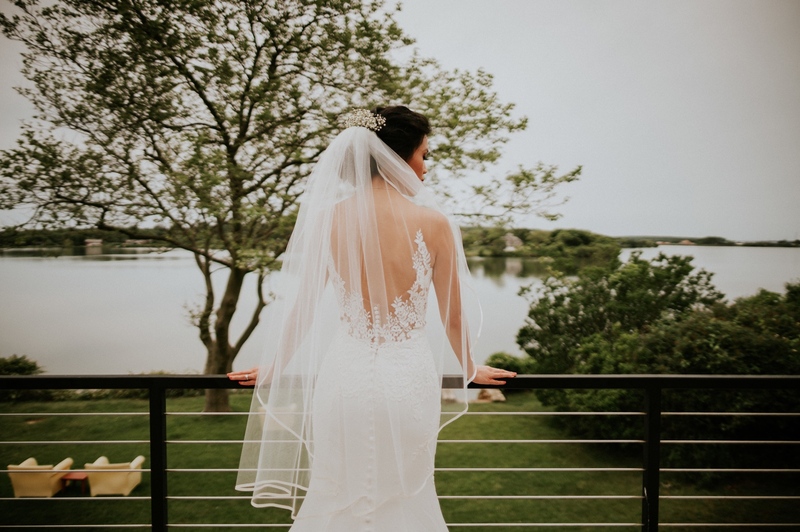 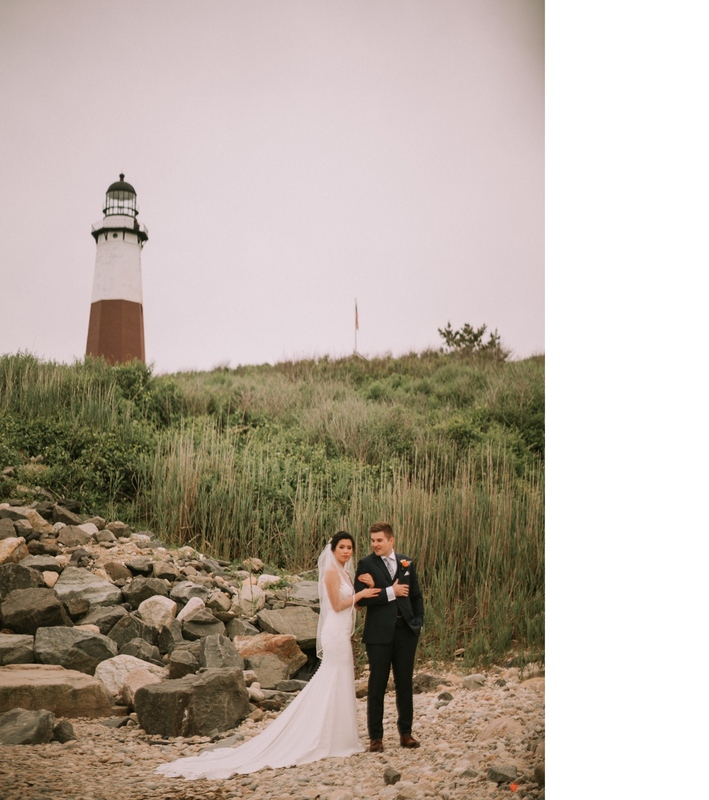 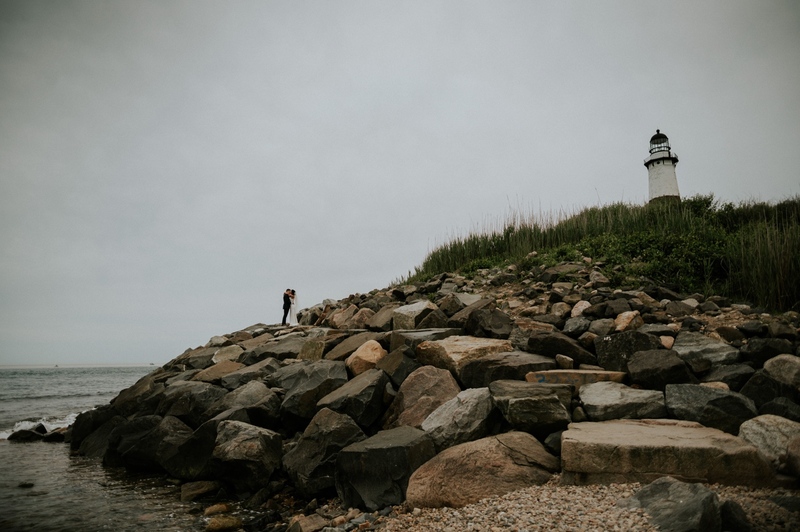 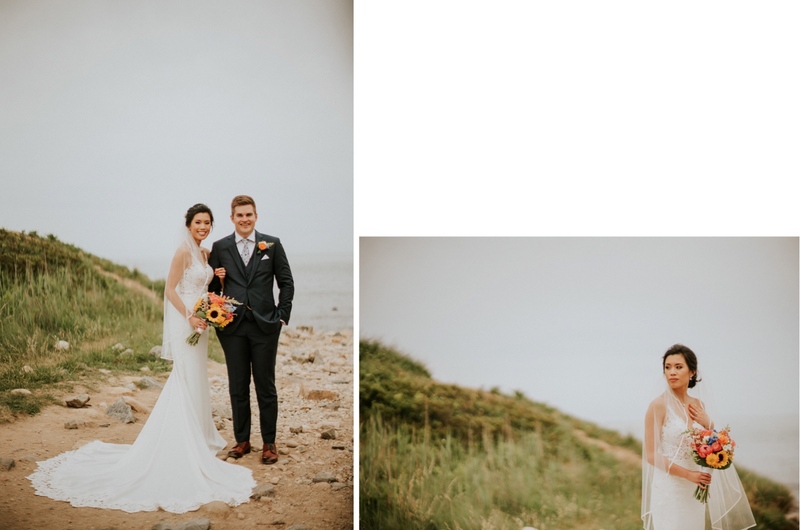 After getting ready at The Breakers in Montauk, Carisa & Dirk met in front of the Montauk Lighthouse for their first look. 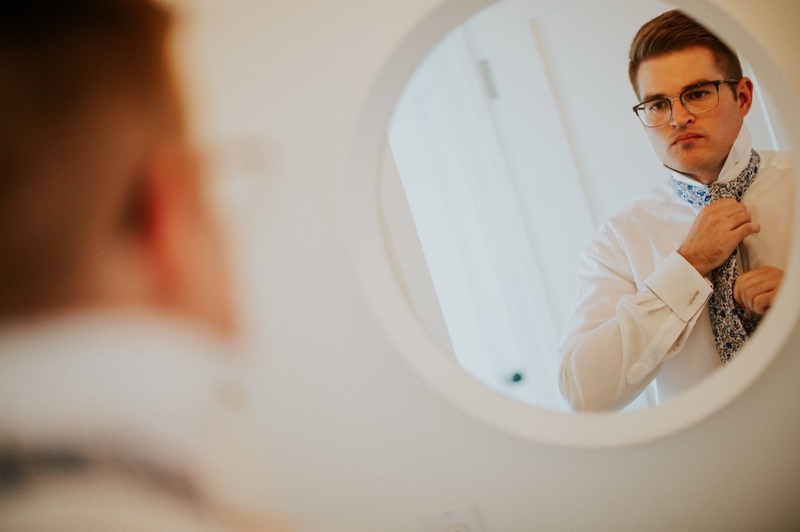 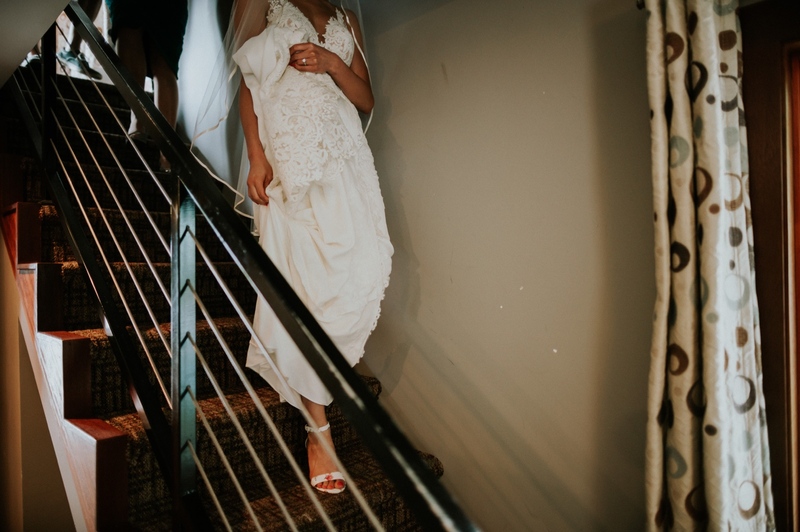 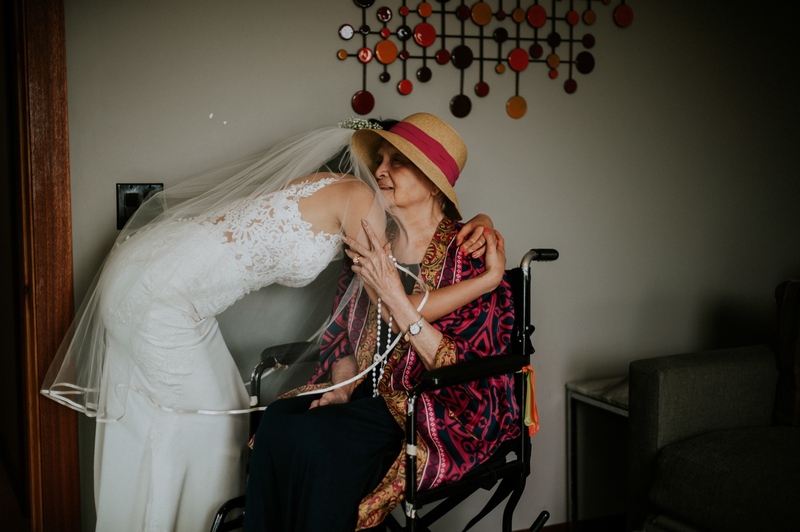 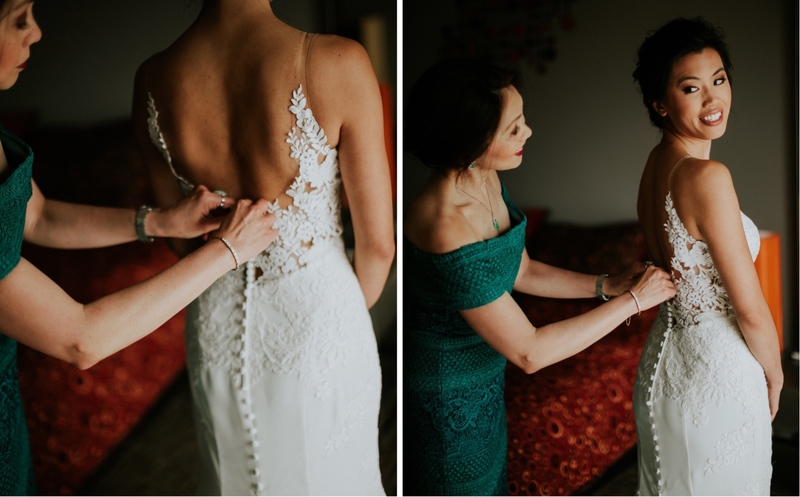 First looks are almost always my favorite part of any wedding day. 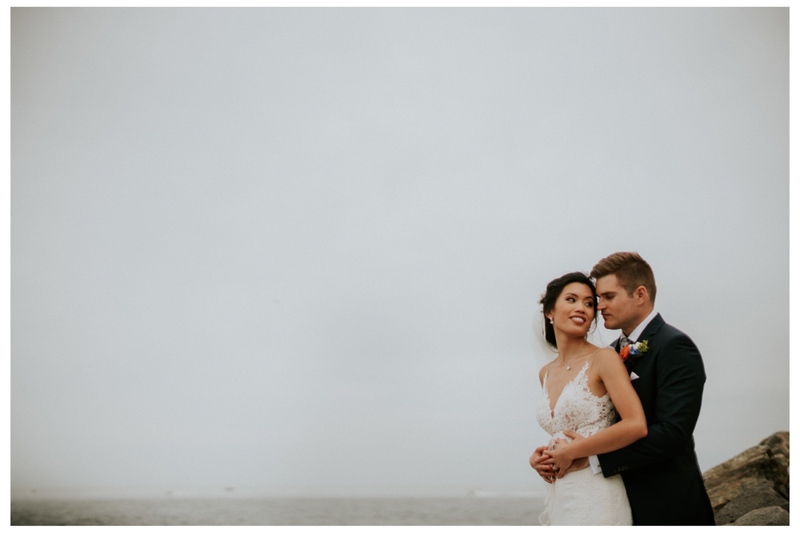 It’s pretty much the epitome of what we do as wedding photographers – balancing the artistry of creative control through choosing the right location, shaping light and composing the scene with intention, while also having a truly unpredictable moment of photojournalism unfold as the couple sees each other for the first time. 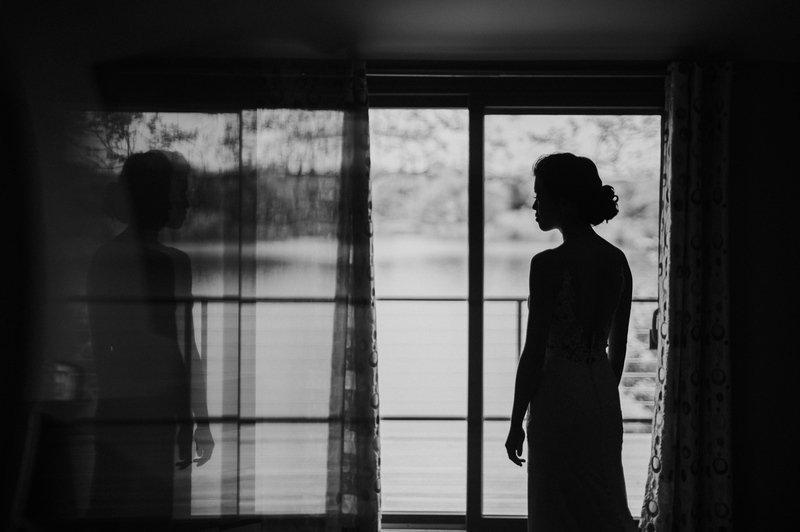 The excitement leading up to their reveal is a story in its own… will they laugh, will they cry (will I cry)? 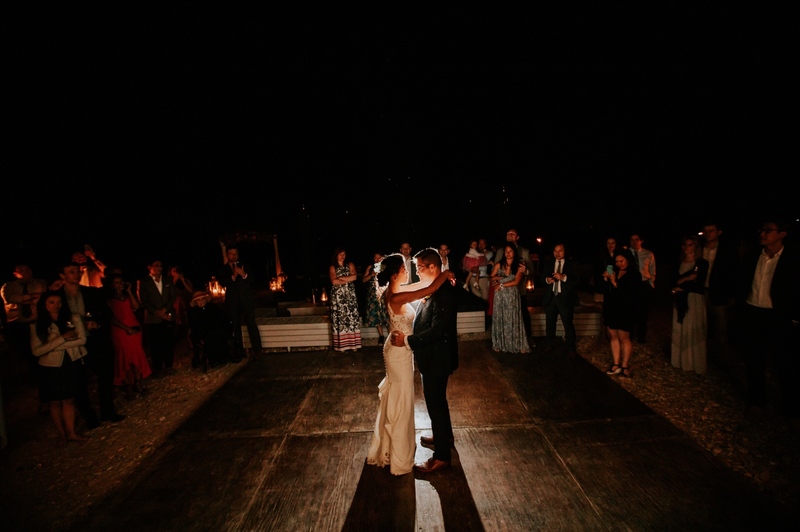 And then… it happens! 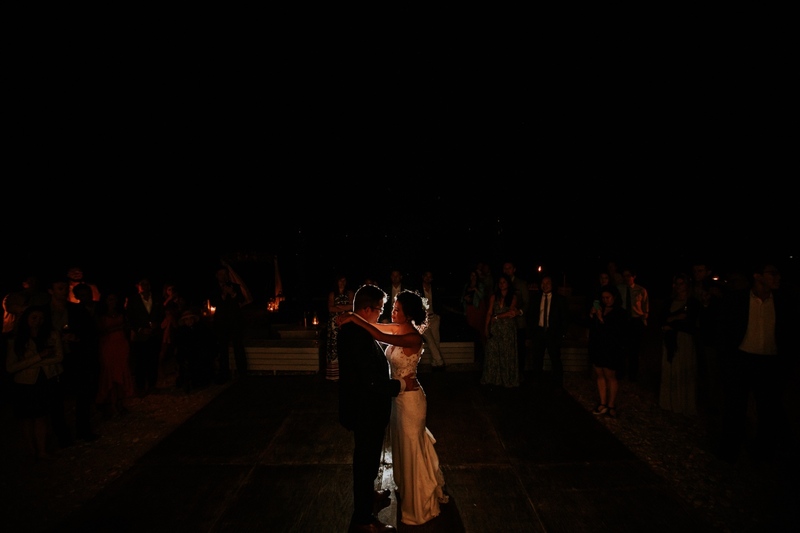 And for Carisa & Dirk we all laughed and cried (and some tourists did too)! 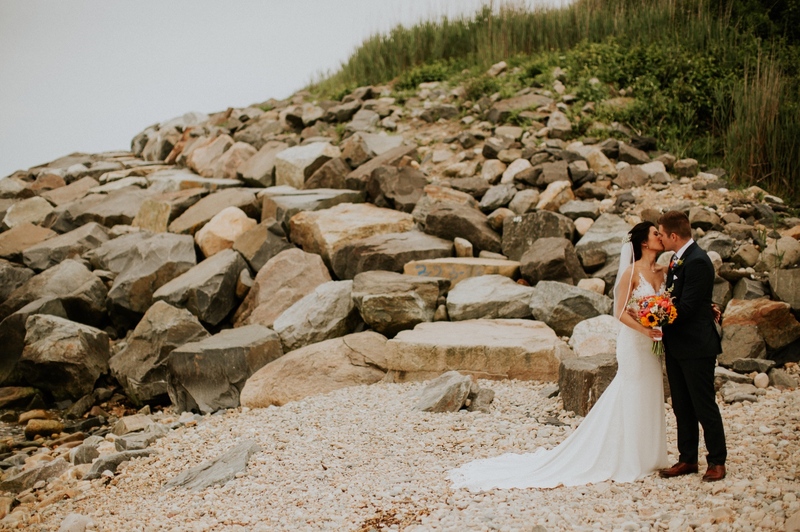 We laughed and cried all throughout Carisa and Dirk’s beach ceremony in Montauk too! 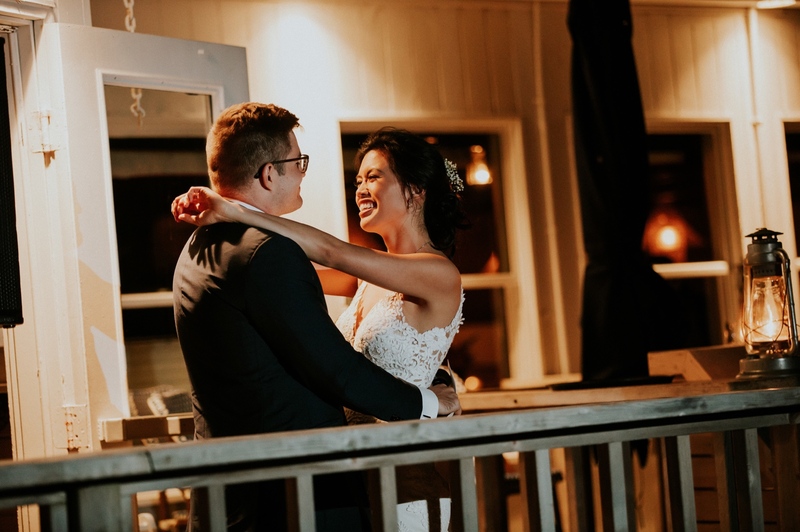 It was my personal favorite event of their wedding day. 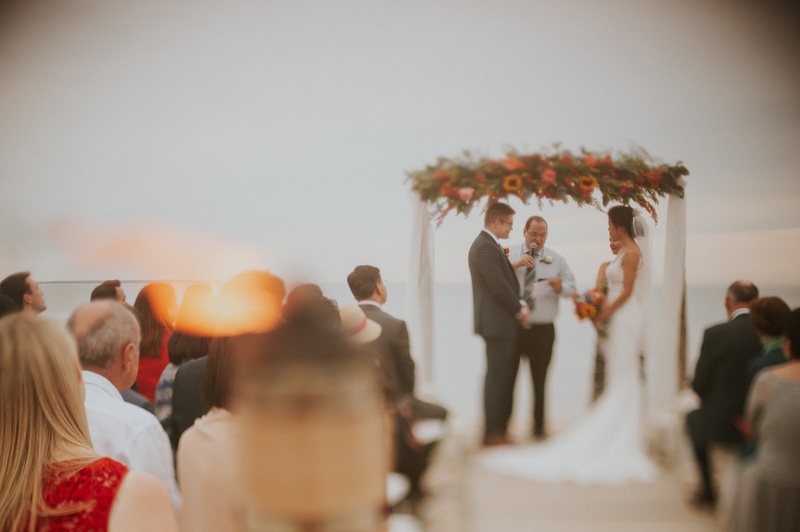 There was an incredible energy about the space they created, and it amplified the amazing ceremony their close friends officiated. 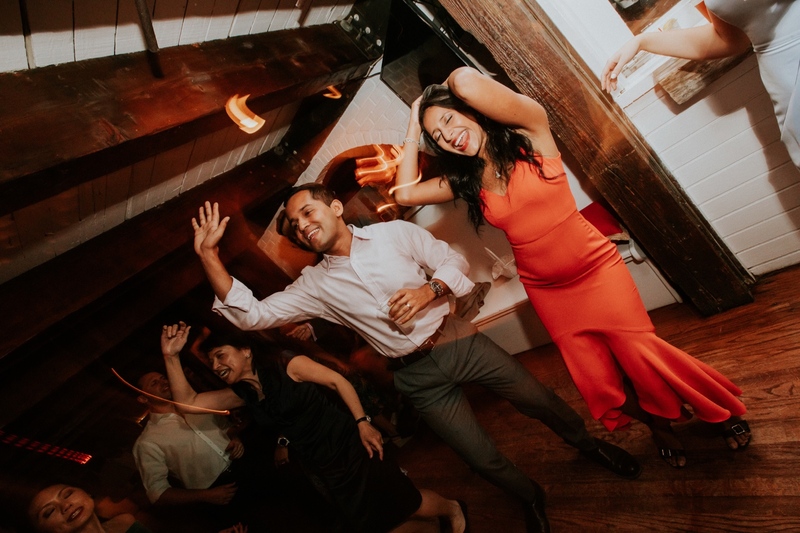 We had previous spent the day together with some of their closest family when they wed at New York City Hall in Manhattan earlier in the week so it felt like the continuation of an even bigger moment (be sure to check out that beautiful celebration for more of the happiest smiles and some of my favorite subway portraits ever). 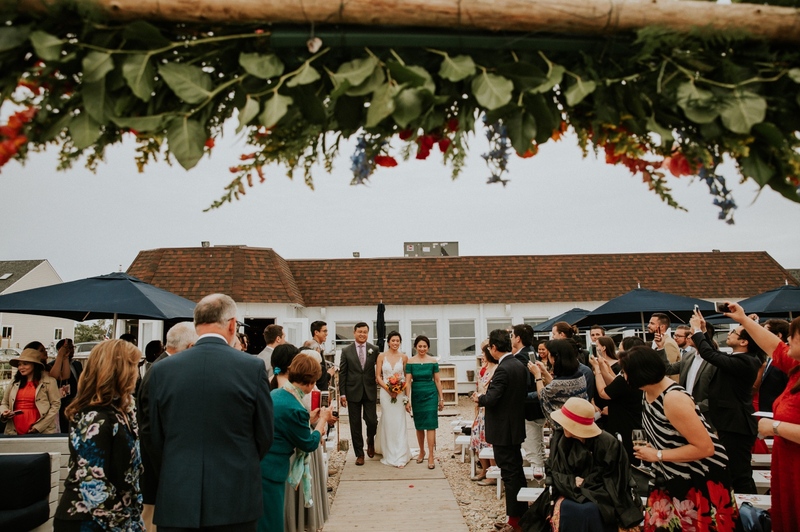 Strawberry Fields Florist created an absolutely stunning archway with floral decorations that were central to their ceremony space. 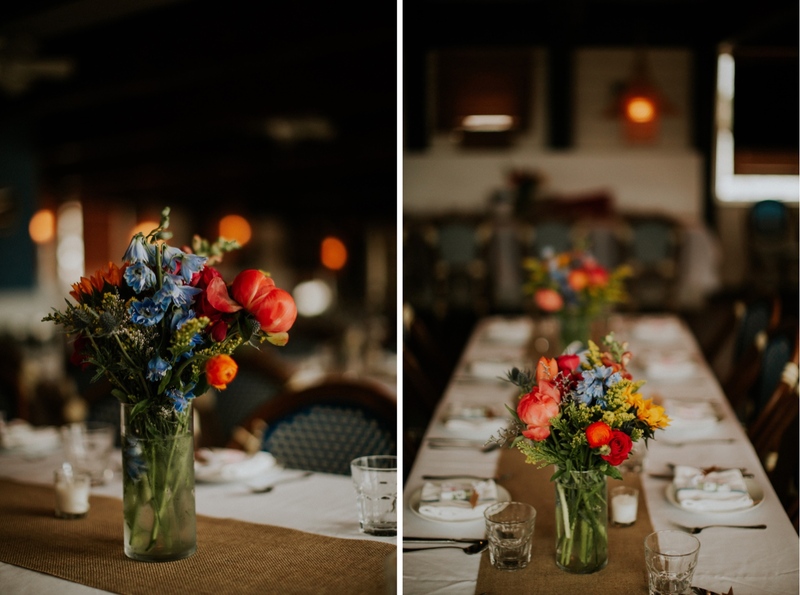 Carisa and Dirk’s vision of creating warm, sunset colored arrangements, for the archway and through the reception area came to life. 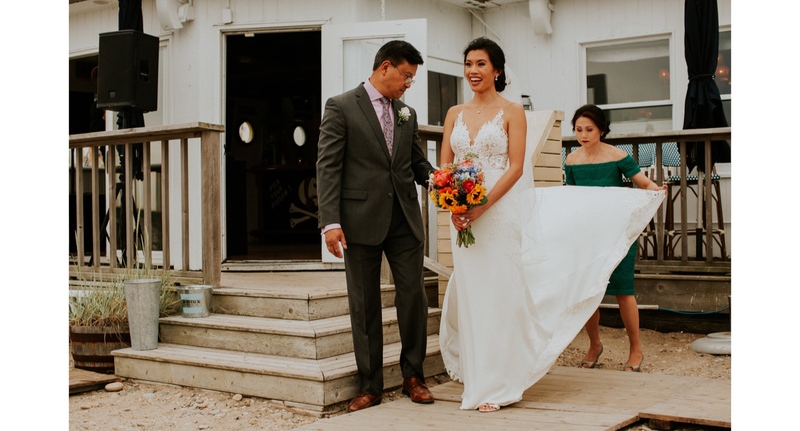 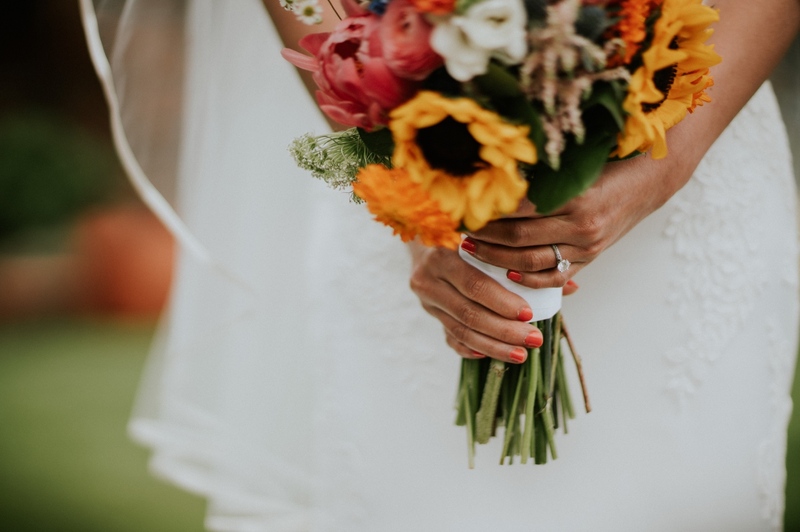 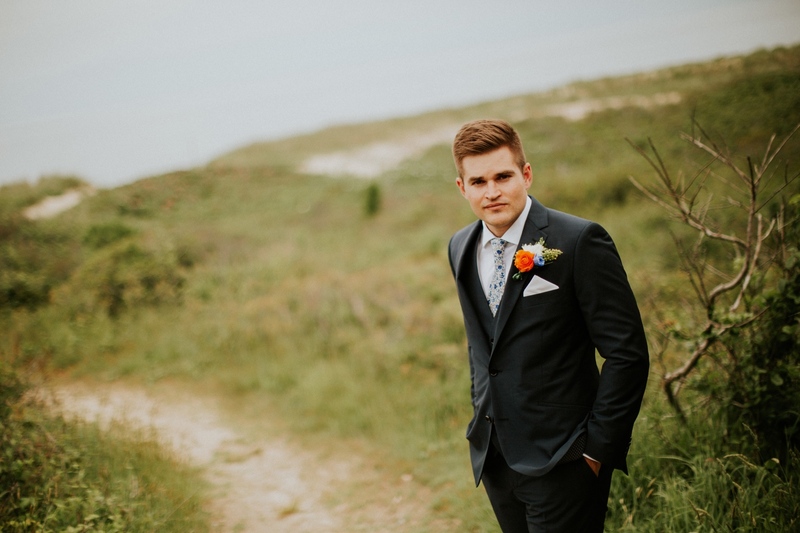 You’ll rarely find such elegant flower arrangements in a Montauk wedding, and we’re truly impressed by their team’s creativity and artistic representation of the couple’s style. 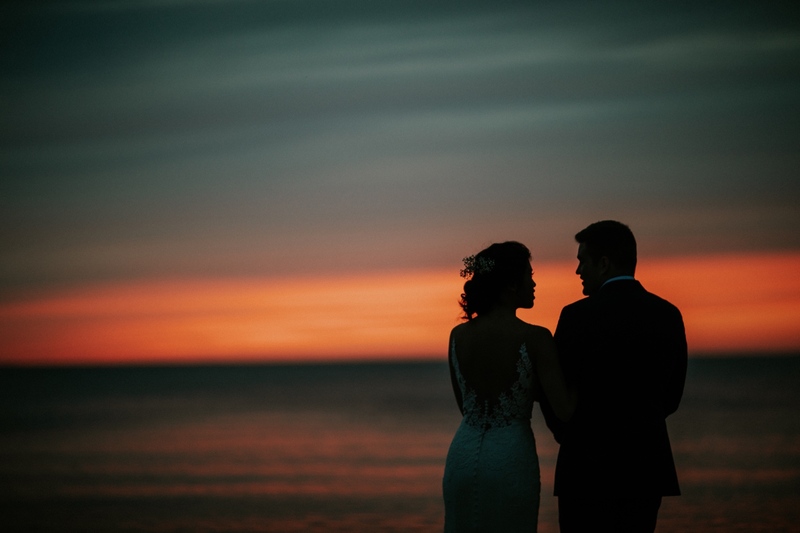 Shortly after their waterfront ceremony, we caught what was perhaps the most amazing sunset of the year. 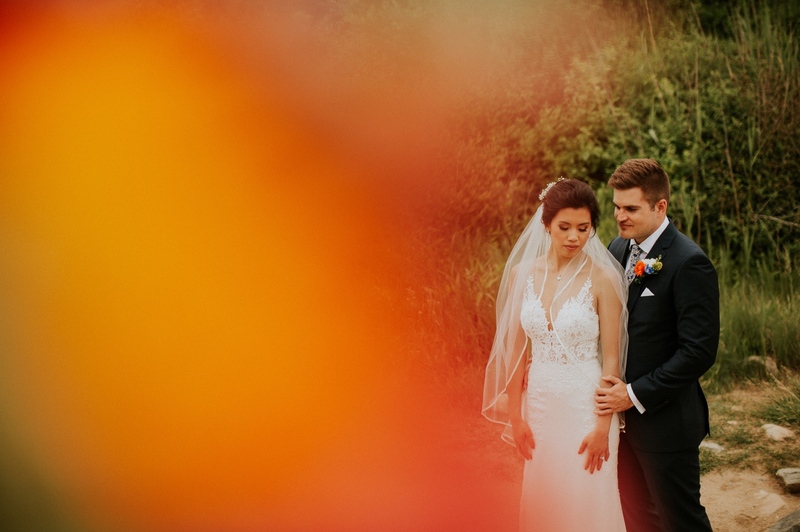 Colors you could only dream of! 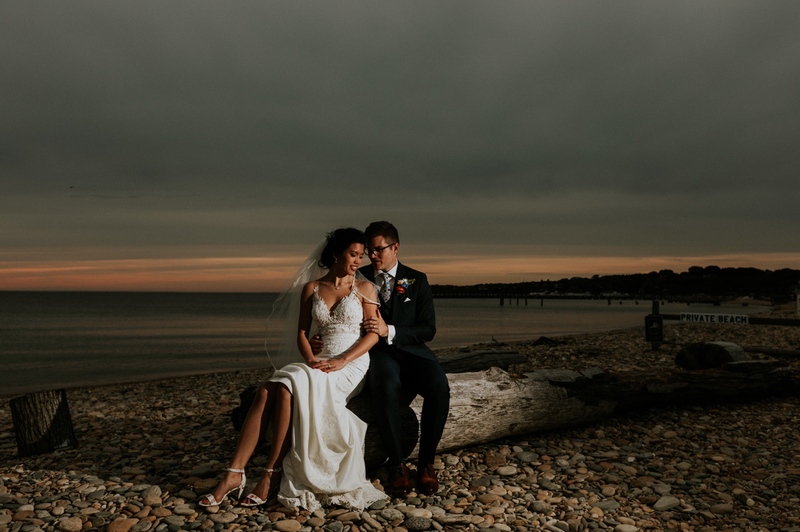 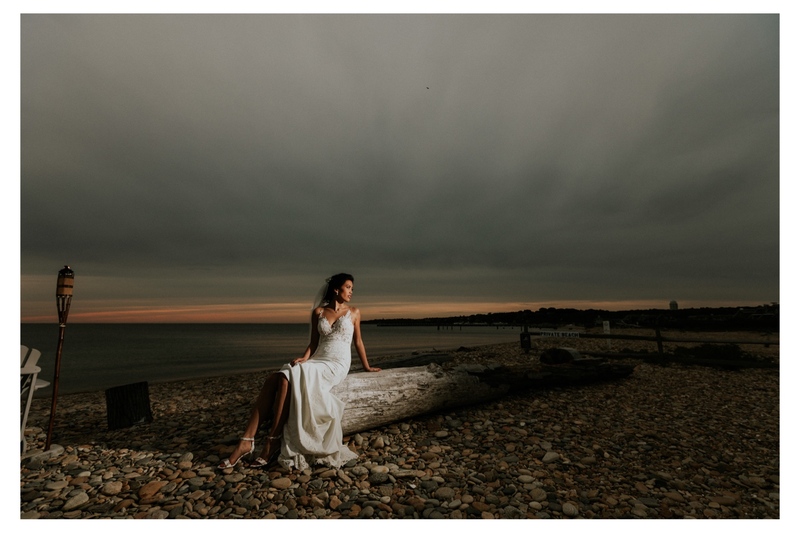 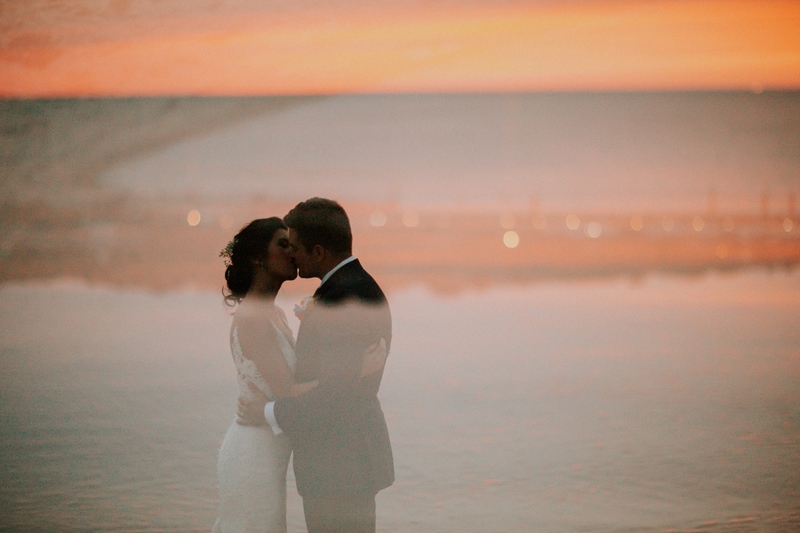 While their guests enjoyed an epic cocktail hour, Carisa and Dirk gave us a few amazing moments to create stunning images against a backdrop of the setting sun and gentle waves. 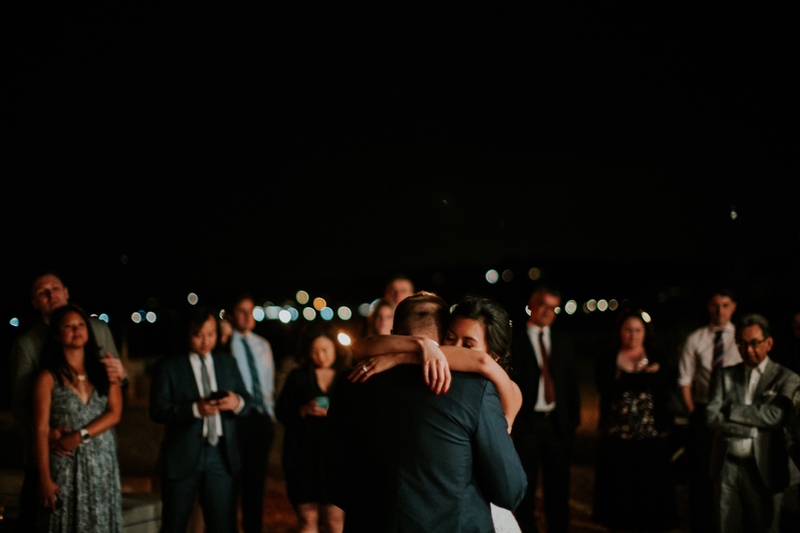 They’re among my favorite portraits of the night. 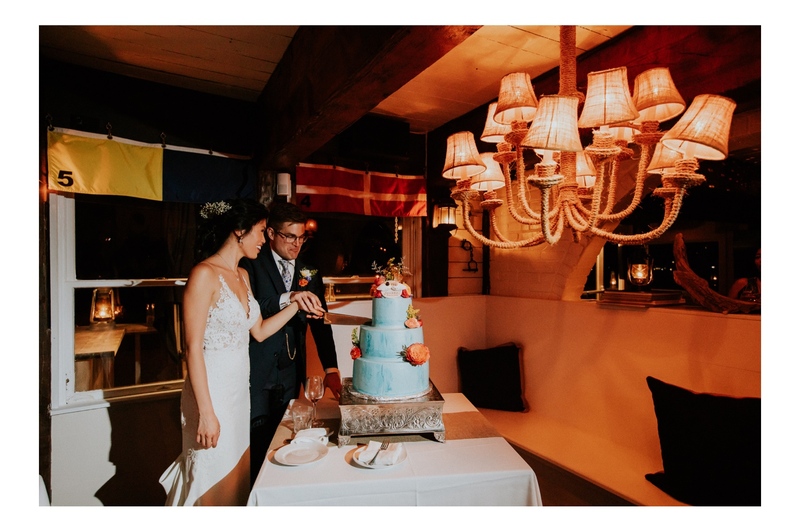 The blue of their cake was intended to look like the ocean and their seal cake topper was special for Carisa. 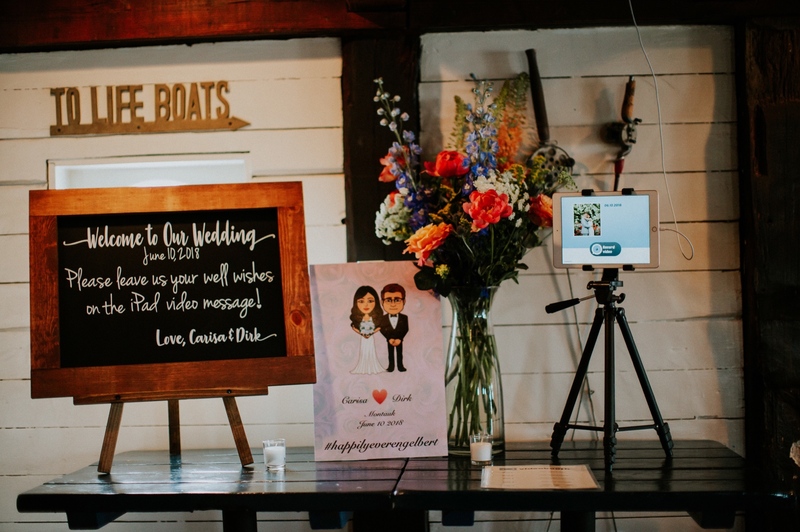 They created personalized touches that helped make the day a lot of fun and memorable for family and friends. 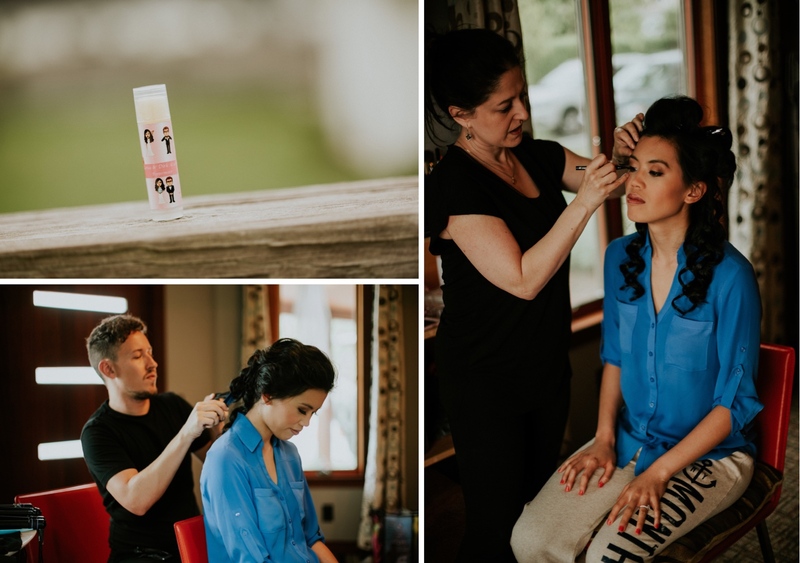 Carisa loves making lip balm, and made wedding-themed sticks as the favor. 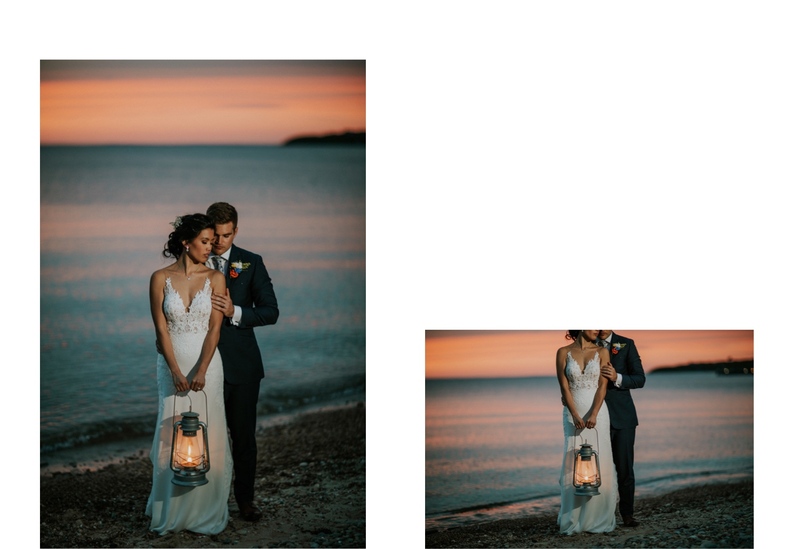 Guests also really liked the sea glass name place cards. 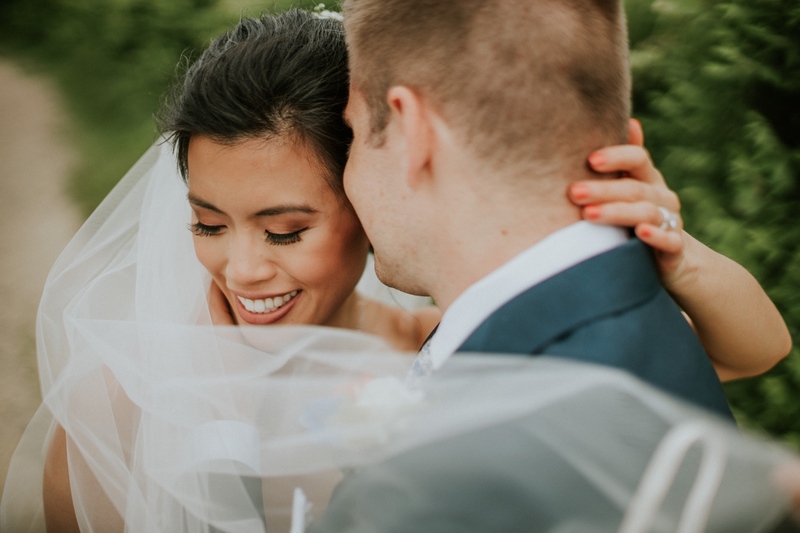 Carisa and Dirk had an effortless and fun style, with a few truly unique accessories that helped add a bit of color and fun to the day. 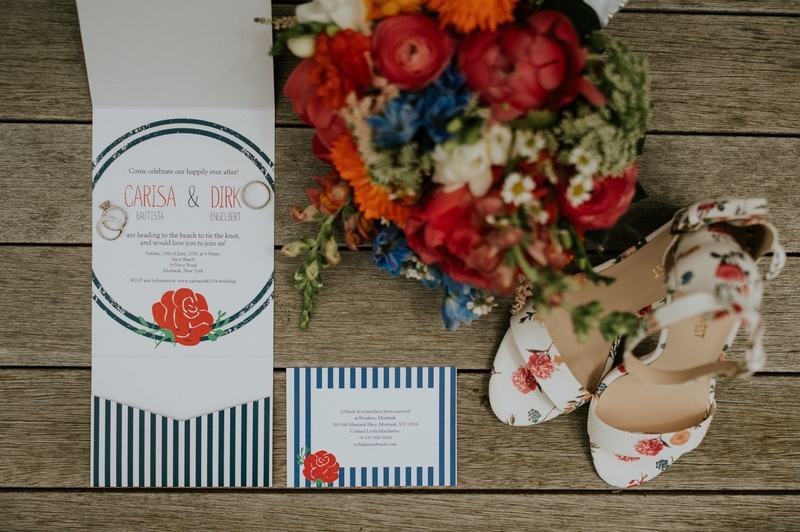 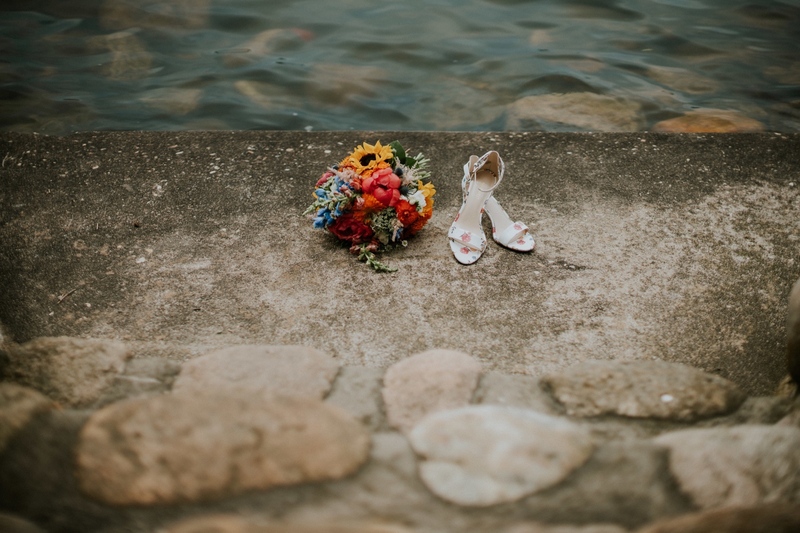 Carisa’s floral shoes, and Dirk’s floral tie were our favorites! 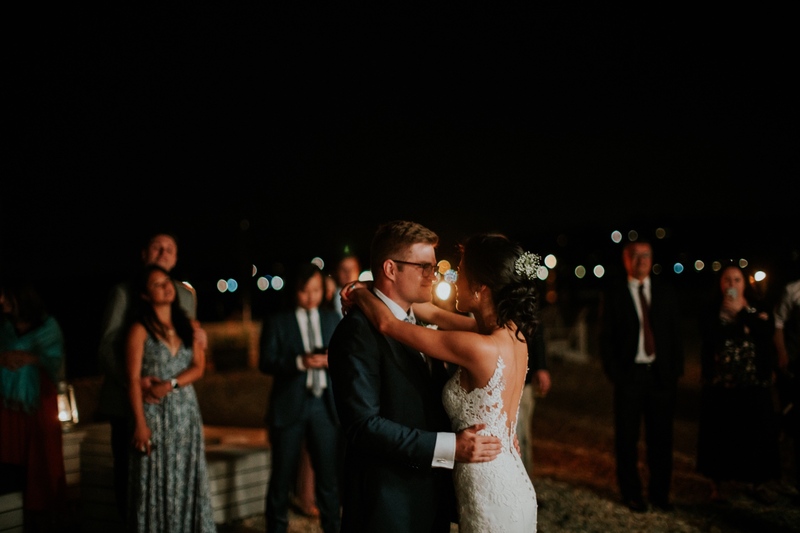 Dirk borrowed Carisa’s Dad’s pocket watch, which was a special touch. 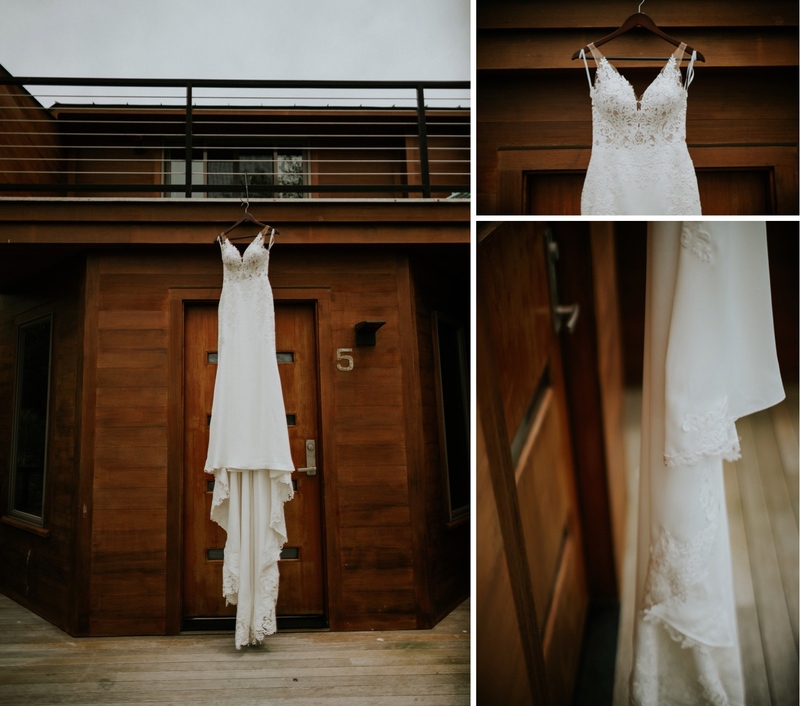 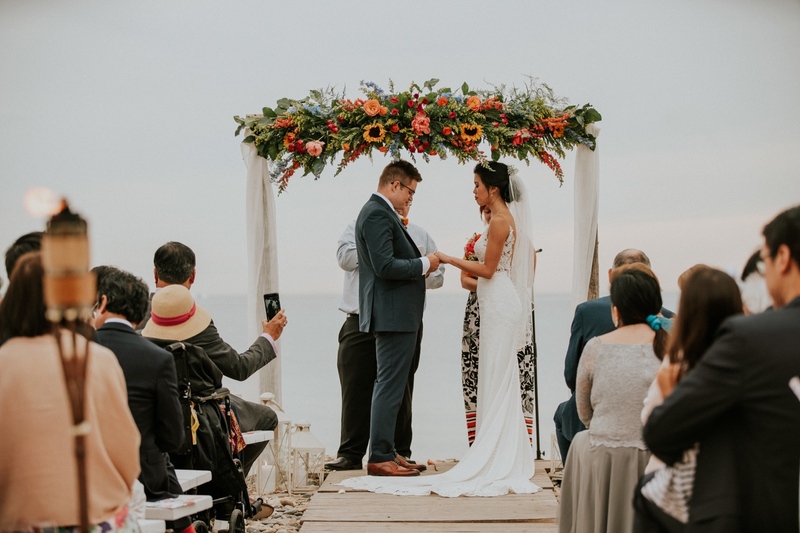 We love when couples include heirlooms in their attire or decor. 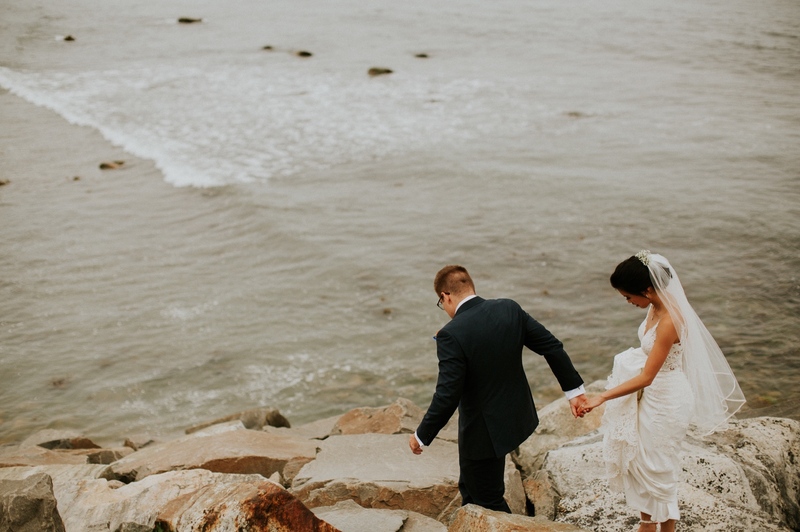 Are you planning and oceanfront celebration? 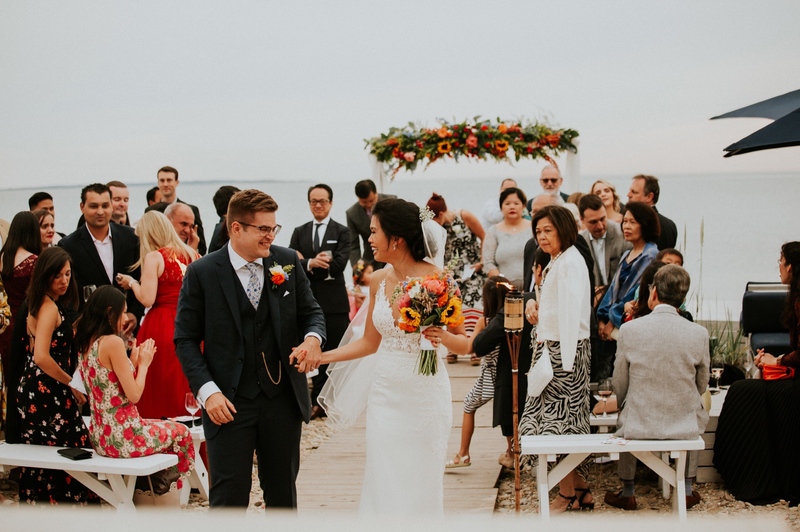 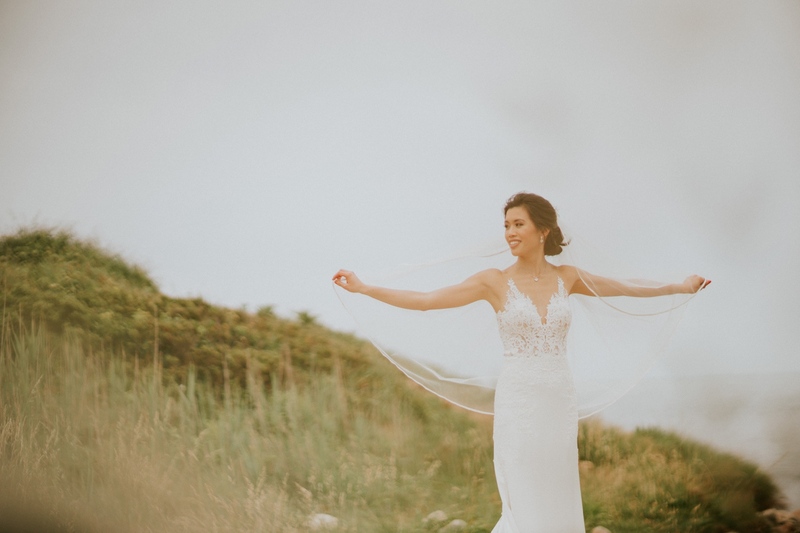 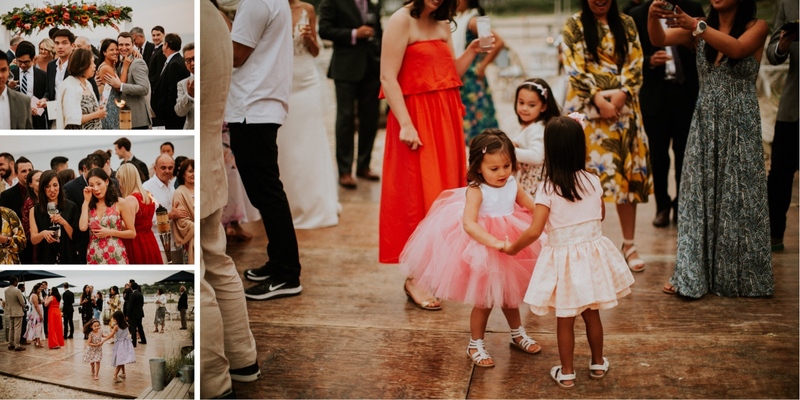 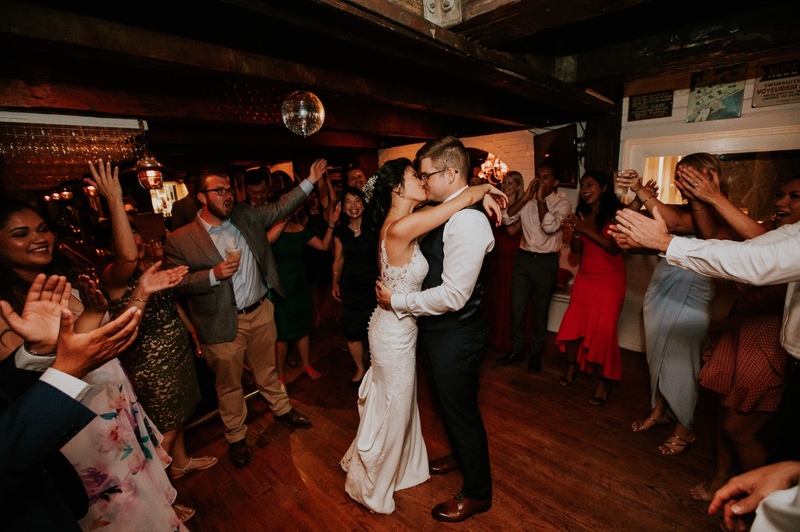 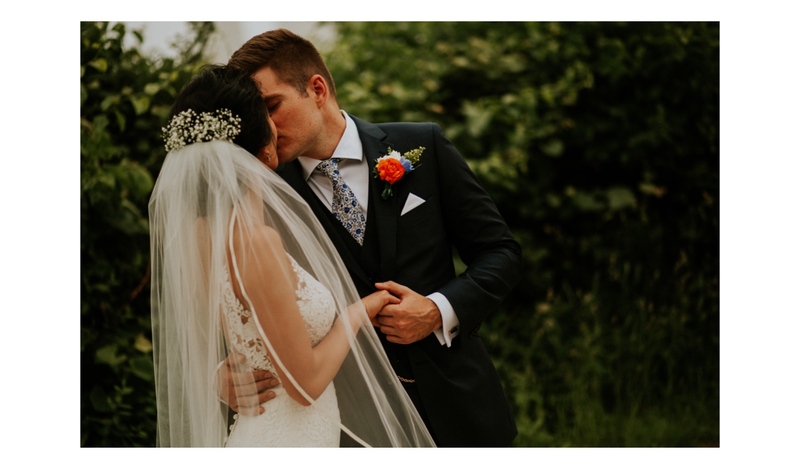 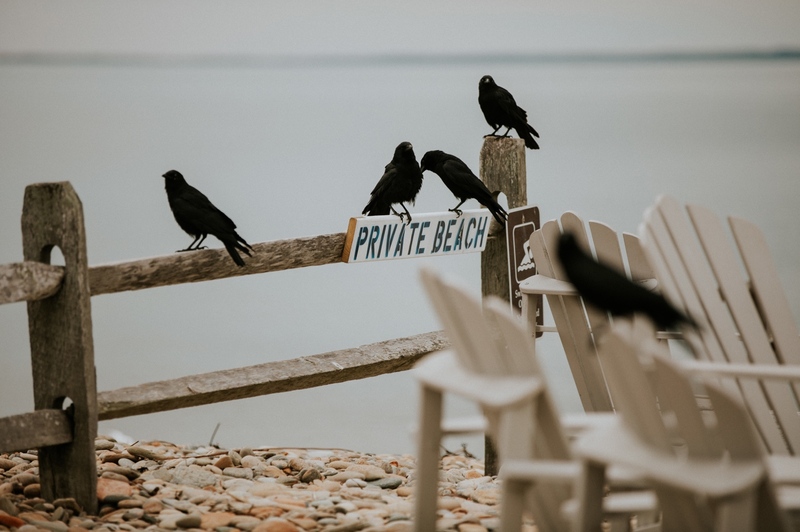 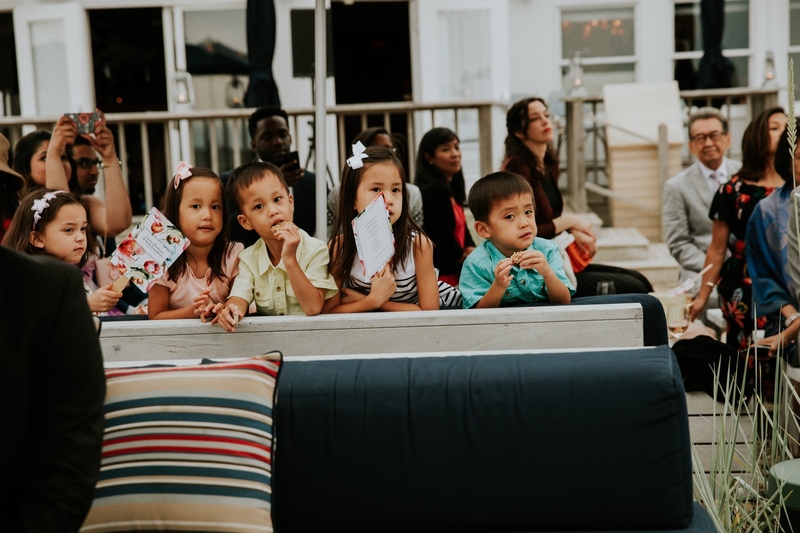 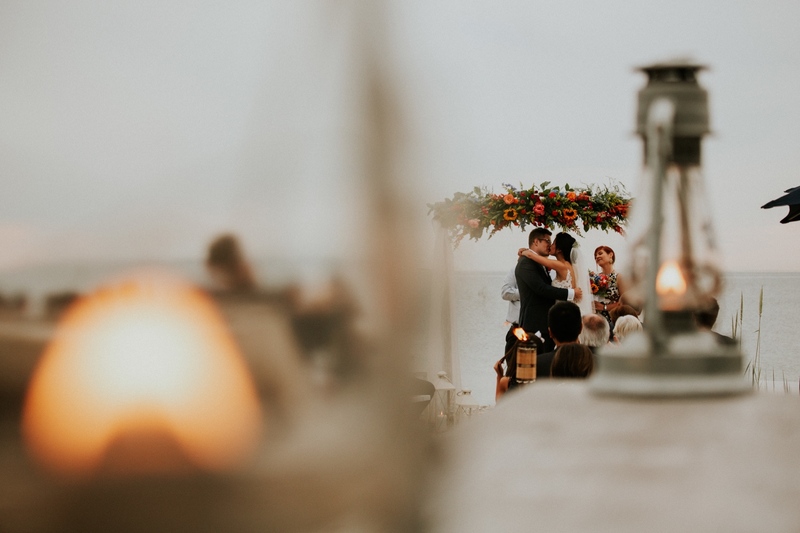 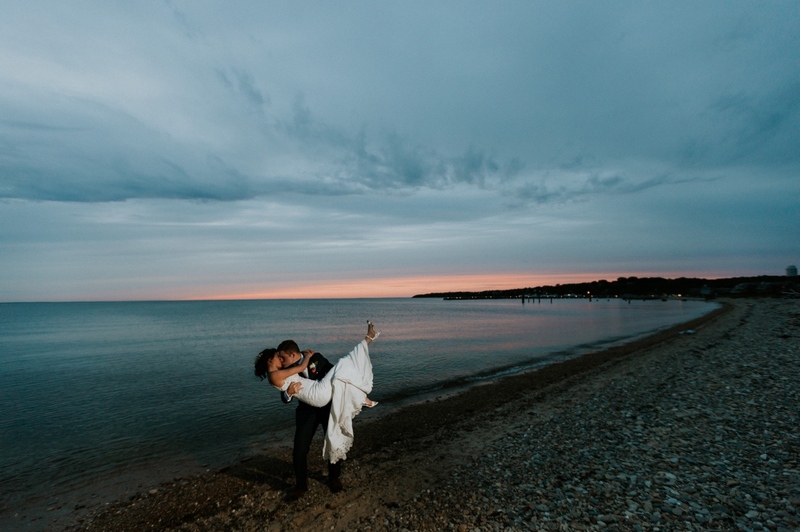 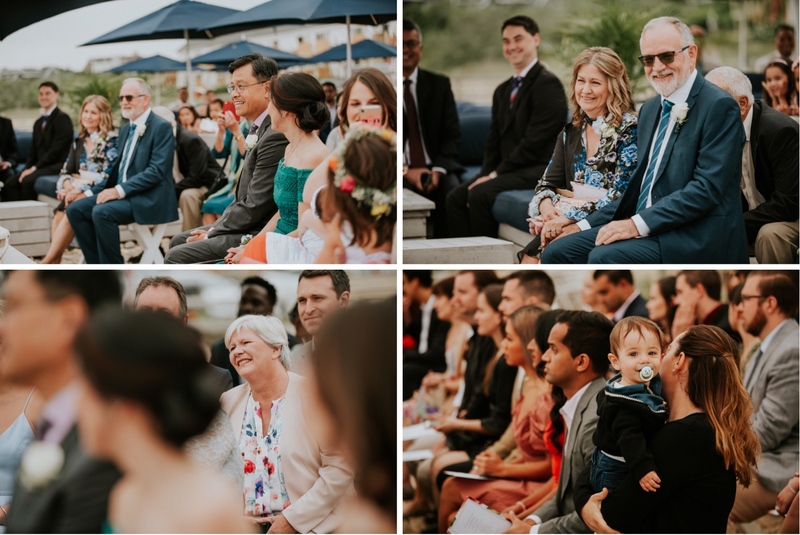 Whether it’s on the beautiful beaches of Montauk, the countless So-Cal surf front destinations, Hawaii or anywhere else in the world, we’d love to be there to celebrate and capture the day with you. 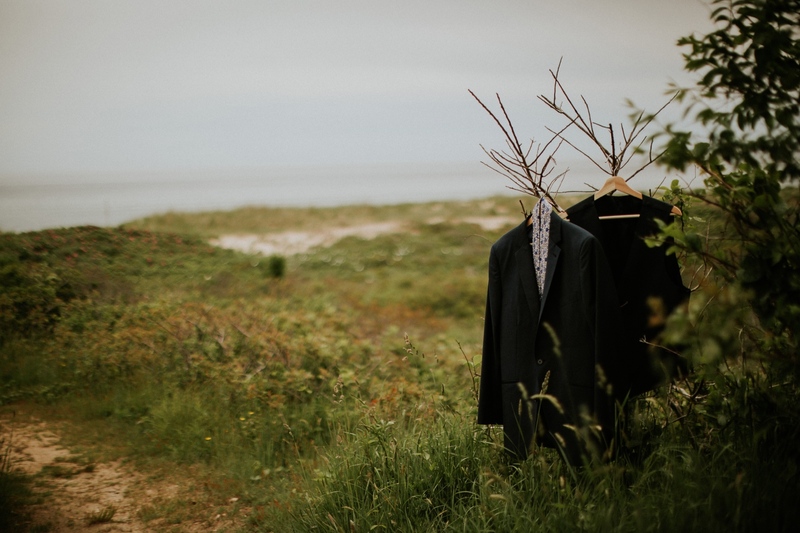 Drop us a line and we’ll help bring your vision to life!